This page has been archived, but has been left here for reference purposes. After several weeks of frequent changes, the reshuffle of TV and radio services broadcasting to Sky and Freesat homes is now almost over. While Sky and Freesat viewers across the British Isles haven't needed to take action, viewers who rely on manual tuning, for example free-to-air satellite receiver users have had to retune often recently. This week, some channels, including CNN, Travel Channel, TruTV, Heart TV, Clubland and BT Sport in standard definition are moving from Astra 2F to Astra 2G and new frequencies as the load is balanced across the three new satellites. These channels are widely available free-to-air across Europe (details below). 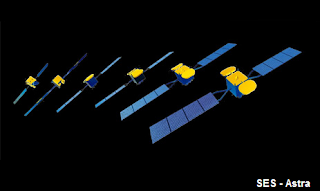 Then the satellite changes are complete, although many expect that there will still be some technical changes to the way services are broadcast, to maximise bandwidth on each satellite transponder at the expense of viewers accessing services outside of the core footprint of the satellites. Eutelsat, which is in the process of redeploying its 28A satellite to a different orbital position, now operates as a virtual satellite provider to Sky and Freesat channels. The satellite company is in control of a band of satellite frequencies that are now being transmitted by rival SES on its satellites. Sky and Freesat services are now fully delivered via new satellites Astra 2E, 2F and 2G, which continue to orbit at 28.2 - 28.35 degrees East. Several channels have moved between satellites to even out the load across the fleet. A number of temporary frequency changes have been completed and those channels are now on their final frequencies, although in the future channels may opt to move again - but this will be unrelated to the necessary changes that have taken place recently. Old satellite Eutelsat 28A is no longer in use and is being moved to be co-located next to Eutelsat 33B, where it will be used for occasional feeds. Earlier this year, services were removed from old satellite Astra 2A. Astra 2D is being moved to serve its twilight years in another orbital position. Unrelated to the satellite changes, UCB has ceased broadcasting on satellite. Its services can continue to be found online via the UCB Player. Additionally, UCB also broadcasts via DAB digital radio. Its TV channel is available on the TVPlayer App. Colors has changed frequencies (details below). Other South Asian channels, including Rishtey and Aaj Tak are now also being distributed on Astra 4 (on the 5 degrees East orbital position @ 12111 H), where they enjoy wider coverage over Europe, also for the benefit of cable feeds. (last updated 11/07/2015) Latest changes in bold. MOBILE USERS: Turn your device to landscape mode to see full data. The following channel has transferred to another transponder during the shuffle. Since we published this page, the main satellite channel tracker websites have now been updated with the latest information: for example, you can now see the full list of free-to-air channels and frequencies at http://www.lyngsat.com/Astra-2E-2F-2G.html. Use Ctrl+F on most browsers to search for the channel you are looking for. has channel 4 been relocated on the satellite making it no longer obtainable?? Your location is outside of the coverage area for Channel 4 via satellite, and since the satellite changes last year, you've been lucky to be able to watch the service with your small roof dish in Hungary. There's been a slight change to the orbital position of the satellite that carries Channel 4 which came into effect on August 1st, and that appears to have finally ended your reception of Channel 4 with that dish.